I still stand by the thought that the best dishes come together by accident. I was leaving town and wanting to use everything I already had in the fridge and pantry. I had some left-over store bought, pre-diced butternut squash that needed to be used, 2 beautiful Opal and 1 Rosalynn apples and a whole red onion. I felt like their pretty colors and sweet flavors would be a good combination… so I played matchmaker and hooked them up. Roasting vegetables has to be my favorite way to eat veggies, hands down. The olive oil, salt and pepper help bring out the vegetables flavor and they end up tasting and feeling like comfort food every time. Especially during the fall. This was so good that I actually think I would include in my Thanksgiving dinner menu next year. Sweet, yet savory, hearty but not heavy… delicious! Line a large sheet pan with parchment pan. 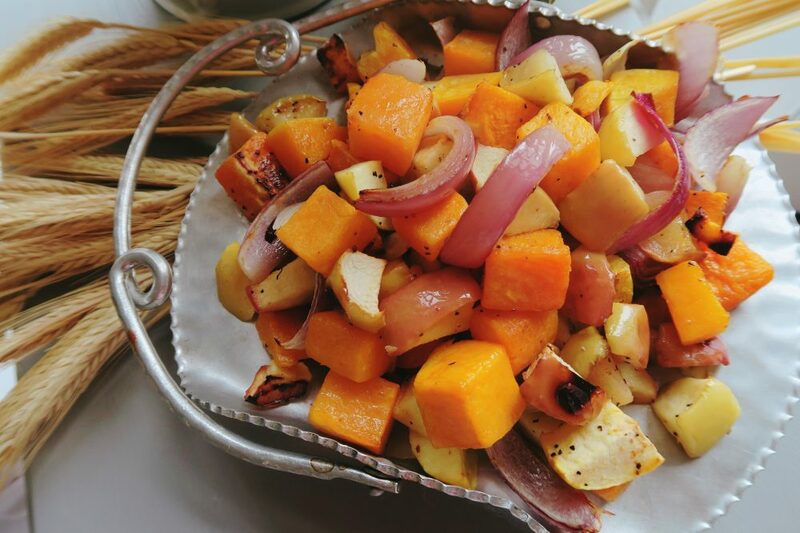 In a bowl, combine squash, apples and red onion with olive oil, salt and pepper. Just enough olive oil to lightly coat all veggies. Place veggies on sheet pan, making sure each piece has its own space. Roast for 30-35 minutes or until all cubes are tender and roasted and slightly browned.